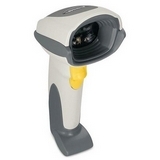 Motorola DS6708 Bar Code Reader [DS6708-SR20007ZZR] - $376.71 : Dealpops.com, Good deals are keep popping up! "Manufacturer: Motorola, Inc Manufacturer Part Number: DS6708-SR20007ZZR Manufacturer Website Address: www.motorola.com/us Brand Name: Motorola Product Series: DS6700 Product Model: DS6708 Product Name: DS6708 Bar Code Reader Marketing Information: The versatile DS6708 Bar Code Reader from Symbol Technologies delivers the functionality of a 1D and 2D Bar Code Reader, digital camera and document scanner in a single device. Designed to meet a wide variety of business needs across a variety of industries, the DS6708 enhances employee productivity and streamlines business processes in retail, health-care, government, manufacturing and more by combining an onboard 1.3 mega-pixel camera with high performance scanning features and superior digital imaging technology. Product Type: Handheld Bar Code Reader Connectivity Technology: Wired Bar Code Dimension: 1D, 2D Image Sensor: Imager Host Interface: Multi-interface Color: Black Dimensions: 6.55"" Height x 2.82"" Width x 4.72"" Depth Weight (Approximate): 6.40 oz Green Compliance: Yes Green Compliance Certificate/Authority: RoHS"